Today I would like to introduce you all to my friend Jenn and her beautiful daughter Morgan who was diagnosed with cerebral palsy at one year old. My way of letting Jenn know how much I respect her and this journey she's on is by sharing her story here for all of you. 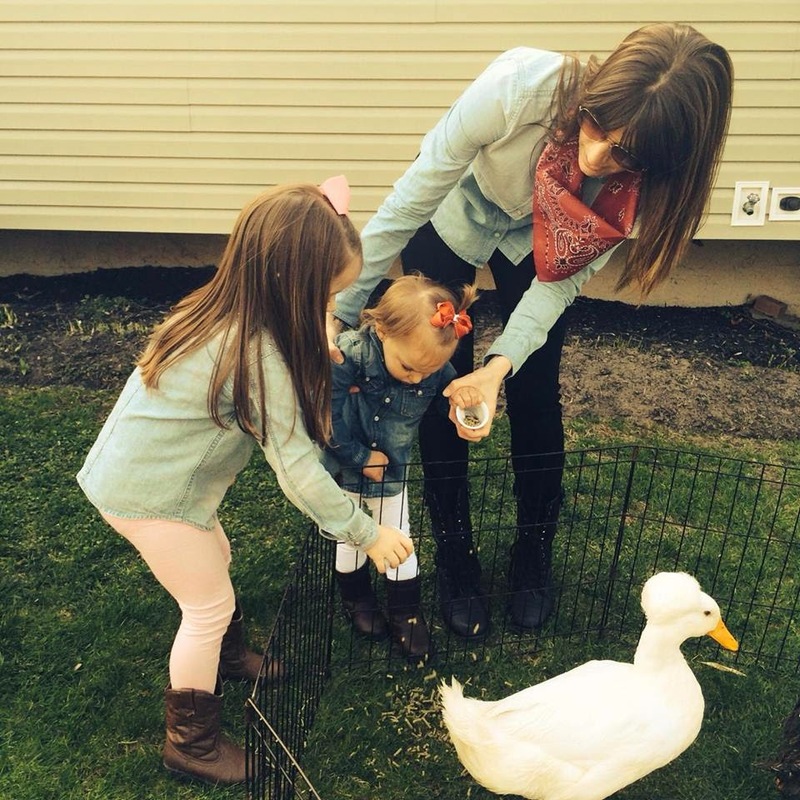 Jenn and her husband Joe are phenomenal parents to their two sweet daughters, and the relationship that these sisters have with one another just melts my heart. Please follow Miracle Morgan's Facebook Page to see all of the progress she's making, and click here if you would like to make a donation towards the equipment Morgan needs to help her overcome the obstacles she's facing. I love seeing this pretty little smile and these insanely gorgeous blue eyes in my newsfeed. 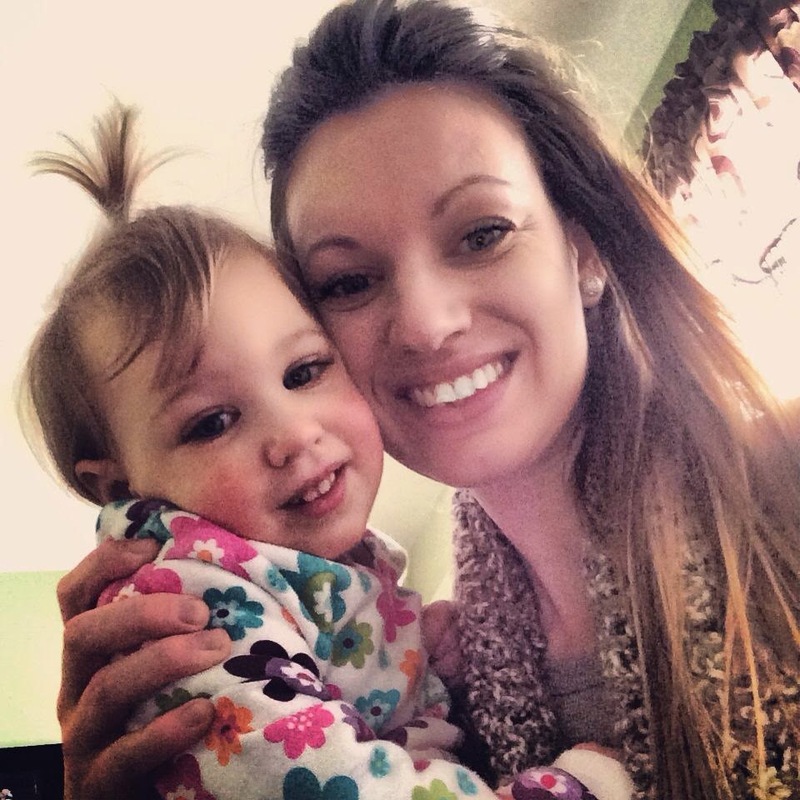 Jenn, you're one of the strongest women I know...no wonder Morgan is such a fighter!!! When my husband and I found out we were pregnant with our second child we immediately were scared. Scared mostly about how it would affect our first daughter who had just turned two. Little did we know what we were really in for. At around 6 weeks pregnant we found out we were going to have twins but one twin had no heartbeat and was significantly smaller on the sono. We repeated the sono at around 12 weeks and my body had already absorbed the dead twin. They called it disappearing twin. My first reaction to all of this news was to cry. Not so much because one twin had passed but because I was scared as to how this would affect the surviving twin. They assured me that nothing was wrong and it is very common. I went into labor full term with no other complications in the pregnancy or delivery. We welcomed our beautiful baby girl Morgan into our family. She came home with us after the normal two day stay in the hospital. The first three months were a nightmare! She would cry non stop. My husband and I would literally pass her back and forth until she fell asleep. She was fed, changed and burped - what else could be wrong? She also was always very tight. I had a hard time changing diapers because her legs were always so clenched closed. Her right arm was always held in close to her body and fists always very tightly closed. I kept telling the pediatrician that I thought something was wrong. She kept telling me that she was just a “tense” baby and colic. I couldn’t take this as an answer. There was something going on here! I switched pediatricians and joined a massage class at the local library. In the mist of waiting for an appointment, during one of the massage classes, the instructor took me aside after class and said very politely that she noticed Morgan wasn’t holding her head up great and all the other things I have already noticed. I explained the situation and she hooked us up with early intervention to get Morgan evaluated. When we went to see the pediatrician he wrote a script for a MRI. While waiting for that appointment we got Morgan evaluated and she was approved for PT and special instruction with a “diagnosis” of gross motor delay. She started this at 6 months old. 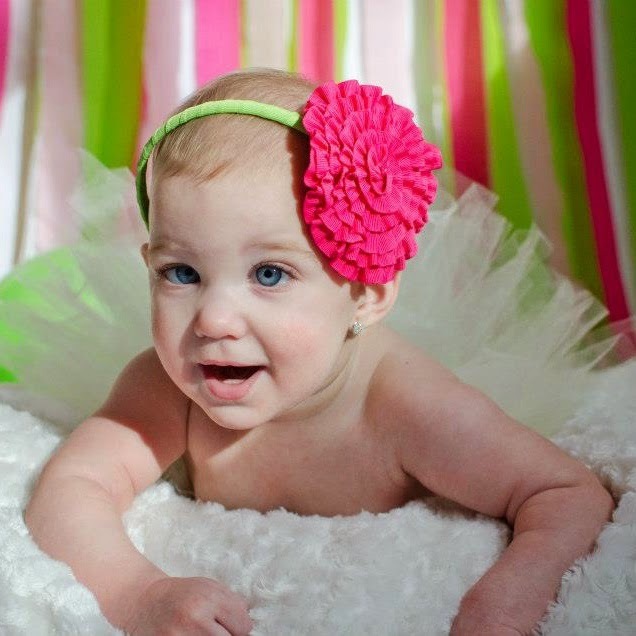 Morgans MRI was done when she was 8 months. The MRI showed “white matter” on a significant part of the top of her brain. The term was periventricular leukomalacia, otherwise known as a stroke. Morgans was bilateral which means it will affect all four limbs. I took this information and immediately started googling. All I kept coming up with was cerebral palsy. 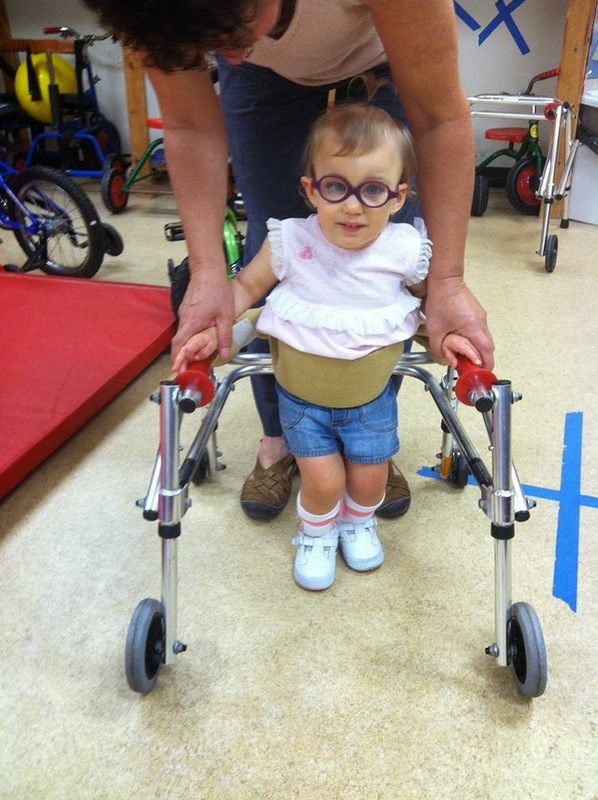 She was later diagnosed with CP at the age of 1. The diagnosis opened up a door for other services. So we then had a full schedule of PT, OT ,Speech, Special instruction, aqua therapy, and hippo therapy (horseback-riding). Morgans diagnosis is spastic quad cp. She has low tone in her trunk and high tone in all four of her extremities. She is now 24 months and doesn’t walk or talk. 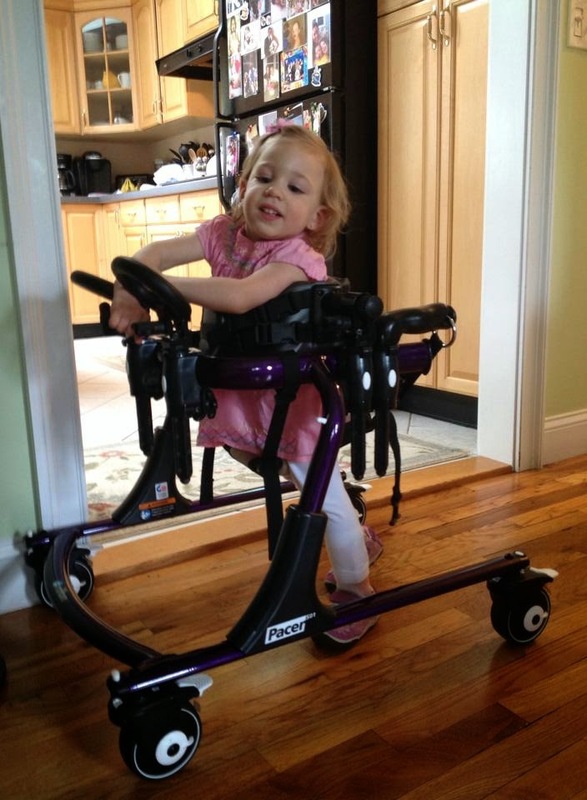 She just started using a gait trainer to help her get around. We are also try to use a Pecs board to get her to communicate as it gets very frustrating not knowing what she wants? 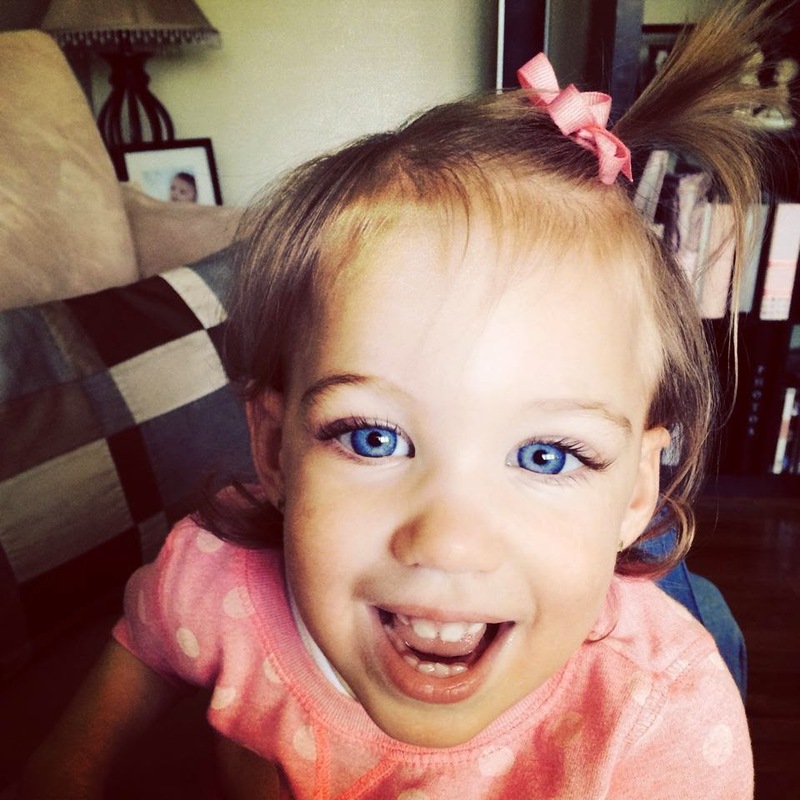 She had double Strabismus surgery at 20 months which went well. She no longer has to wear glasses or patch her eye. She has feeding issues as well. She is still on baby food because of her inability to chew solids. She's drinking from a sippy cup but we are in the process of transitioning her to a straw cup. We are hoping this may help with her speech. She can roll over and commando crawl. She is ALWAYS happy and puts on smile on our face everyday! We have a long road ahead of us. We live on HOPE! Staying hopeful is extremely hard but her motivation and strength get us through each day!